High groundwater levels usually lead to damp or even wet crawlspaces. It is of the utmost importance to have a well ventilated crawlspace. It is commonly forgotten to ventilate crawl spaces when adding to the construction of a given residence. 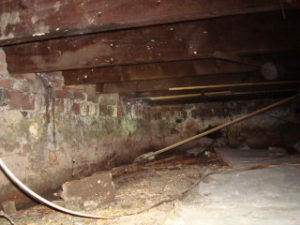 A damp crawlspace often causes cold livingroom floors. In these cases insulation provides the solution. This is achieved by both, applying insulation on the underside of the wooden beams underneath the flooring and in the crawlspace as well. The government endorses this type of insulation through the application of lowered taxes of only 6%. H.V.O. is able to provide you with adequate solutions for any moisture problems through expert research pertaining to the specific problems you might be experiencing. The options include the application of a shell bed as well. This form of insulation is moisture regulating as well. 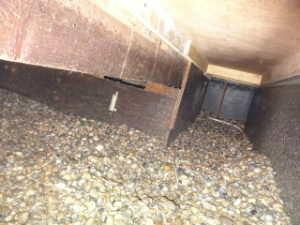 This application, however, is dependant on the available space underneath the wooden floor beams. We will provide you with additional information if this option is to be considered.